Mona-Lisa Englund was a successful elite-level sportswoman within various sports during the 1940s and 1950s. Mona-Lisa Englund was born in Lilla Edet in 1933. She displayed a talent for sports at an early age, particularly within athletics. By the time she was 10 years old she had already joined Kvinnliga IK Sport in Gothenburg. Two years later she won her first four trophies in the school district championships. The following year she won two events at the so-called Folkskole Olympics in Stockholm. Her first appearance at the national championships was as a 15-year old in 1948 and she achieved second place in both in the high jump and triathlon (100 meter sprint, high jump, and javelin). That same year she made a successful debut as part of the national team which competed against Denmark. In the ensuing years she was a dominant figure in the national championships. She won seven golds over the course of three years: for the 80 meter hurdles in 1949-1951; high jump in 1950; triathlon in 1949 and 1950; and pentathlon in 1951. Mona-Lisa Englund held the Swedish record for the 80 meter hurdles, triathlon and pentathlon for a time. She was an accomplished points-scorer in each of the three international championships she competed in, all of them against Denmark. She won several first-place prizes during her school years. Mona-Lisa Englund was chosen to represent Sweden in the European athletics championships at Brussels in 1950. There she competed in the pentathlon, in its first outing in the European championships, and achieved fourth place. Her performances during the ensuing years made it inevitable that she would be selected to compete in the 1952 Olympic Games at Helsinki. However, she began to suffer from injuries from 1951 onwards, and they proved to be persistent. She had to abandon her dreams for the Olympic Games and what had appeared to be a promising, much-lauded, athletics career came to an end. The silver medal she won for the 1952 national championships pentathlon, along with several gold medals won at the district championships that same year would be the last athletics medals Mona-Lisa won. Mona-Lisa Englund also played handball, again as a member of Kvinnliga IK Sport. She appears to have already competed as a member of their A-team in 1948, and to have played a part in the team’s great successes during the following decade. 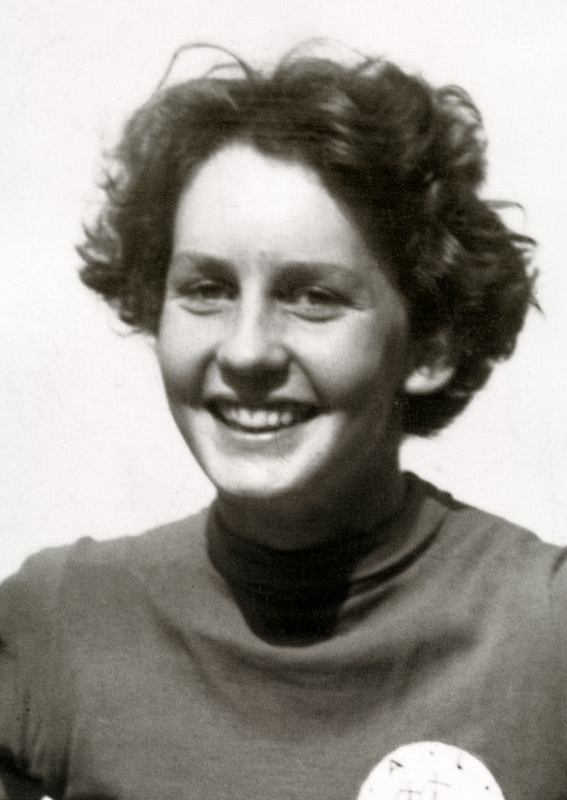 Mona-Lisa Englund won eight national championship insignia in the period up to and including 1950, first in outdoor-handball in 1950 and then in indoor-handball in 1951. She made her debut on the national team in 1949, along with her older sister, the same team which won the Nordic championships. She was also in the winning team in 1953 and 1955. By the time Mona-Lisa Englund retired from competitions in 1956 in order to work overseas she had participated in 16 international competitions. She tended to play offense but towards the end she was mostly in defensive positions. It seems that the injuries which prevented her from competing in athletics did not seem to have a negative impact on her handball playing. Whilst she was a junior competitor Mona-Lisa Englund also played badminton. She was a member of Örgryte Idrottsällskap (ÖIS) where there was a badminton department. She displayed great talent in this sport as well. At the junior national championship in 1950 she made it into the final and in 1951 she won both the singles and doubles – together with Yvonne Dahlberg of Växjö BK. She won first place at the district championships in 1955. Mona-Lisa Englund was also a figure skater. She was a member of Gothenburg figure skating club (GK) in which her father, Helmer Englund, seems to have been the driving force. As a consequence of weather issues GK – established in 1943 – was unable to hold their first competitions for the district championships until 1947. Mona-Lisa Englund came first in the junior rankings. The next district championships were not held until 1950 in Umeå. There Mona-Lisa Englund won the senior rankings and along with Elof Nicklasson she also won the pairs competition. Mona-Lisa Englund and her club team-mate Ronny Hall won the Swedish champions at the 1951 junior national championships. There is no information as to whether she continued to figure skate in the ensuing years. However at the 1955 district championships she won both the singles and pairs competitions, once again with Ronny Hall as her partner. 1956 was the last year Mona-Lisa Englund placed in the top-end of the results lists. She achieved second place in pairs at the 1956 national championships, again with Ronny Hall, and repeated this achievement at the Nordic championships. Mona-Lisa Englund also contributed to the world of figure skating by producing an instructional book. She contributed to the book Barnskridskoskola, first released in 1965, in which she was responsible for the figure skating appendix. In 1969 she published a book called Konståkning, which was translated into Danish that year. In 1974 she released Konståkning för alla, and in 1977 she published Lär dig mer om konståkning, which contains contributions by several authors. Mona-Lisa Englund graduated as a physical education director from the Gymnastiska Centralinstitutet (GCI) (central institute of gymnastics) in 1956. She then worked as a sports instructor at the institute. Towards the end of the 1950s she also worked as a sports instructor at Stanford University in California, USA. She married the dentist Carl Anders Henrik Crispin in 1960 and they had two children together. Their daughter Anne-Charlotte Crispin won the junior national championships in 1973 and national championships in 1977. Mona-Lisa Englund died in Täby in 1999. The Kviberg area of Gothenburg has a street named after her – namely Mona-Lisa Englund’s Väg – which was inaugurated in 2004. Mona-Lisa Englund, www.skbl.se/sv/artikel/MonaLisaEnglund, Svenskt kvinnobiografiskt lexikon (article by Lennart K Persson), retrieved 2019-04-22. Other: Svenska Handbollförbundets hederstecken "Stor Flicka"